What do you guys think of the swisschamp? Discussion in 'Multi-tools & Multi-purpose Knives' started by SuzukiGS750EZ, Jul 12, 2009. It looks like it could fit all my needs except a clock/light. Is it heavy? Large? Uncomfortable to use certain tools because of the size? The Swiss Champ is one of my favorite edc items. It is a trade off though as it provides many tools,it is bulky. It is usable though. I have average sized hands and get a good grip on it during use. Mind you this is the SC only,the XLT champs etc are too large to grip for me and 99.9 percent of us. Carrying it is not an issue for me. I purchased an official Victorinox belthanger. 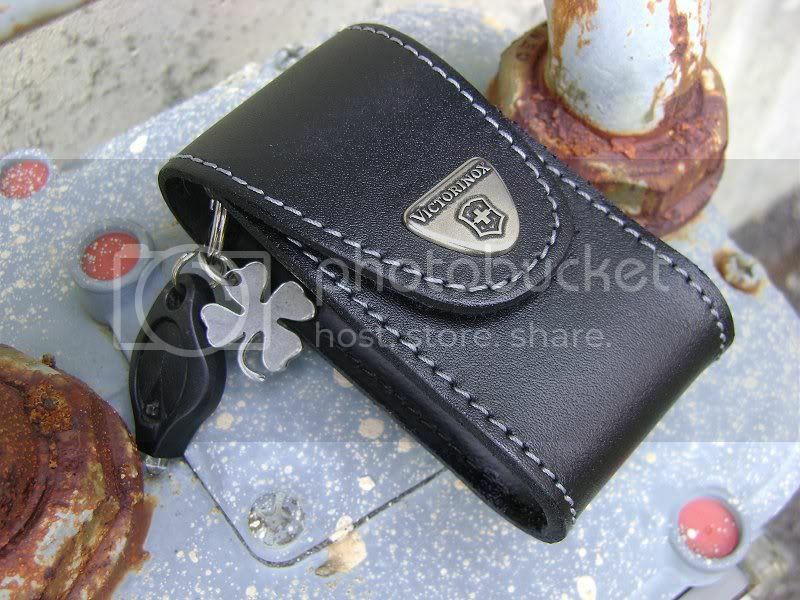 It is metal,clips to your belt and has a small chain that attaches to the keyring on the SC. The SC hangs inside my pocket,above the bottom. My pants aren't weighed down in anyway. You can improvise and just tie a length of paracord or shoestring to your belt. But for around 8 or ten dollars,the Vic belt hanger is nice. I EDC the Champion Plus which is a SwissChamp without the pliers. I love it, it's all I carry except when I switch it out for my Huntsman or Executive when I'm at church or in the city. I do have a SC on order, even though I don't like the pliers I figured I should own at least one SC in my life. I usually belt carry my Champion, pocket carry is fine in shorts or my looser jeans, or any pants with a handy inner pocket. The Swisschamp is the best SAK ever. 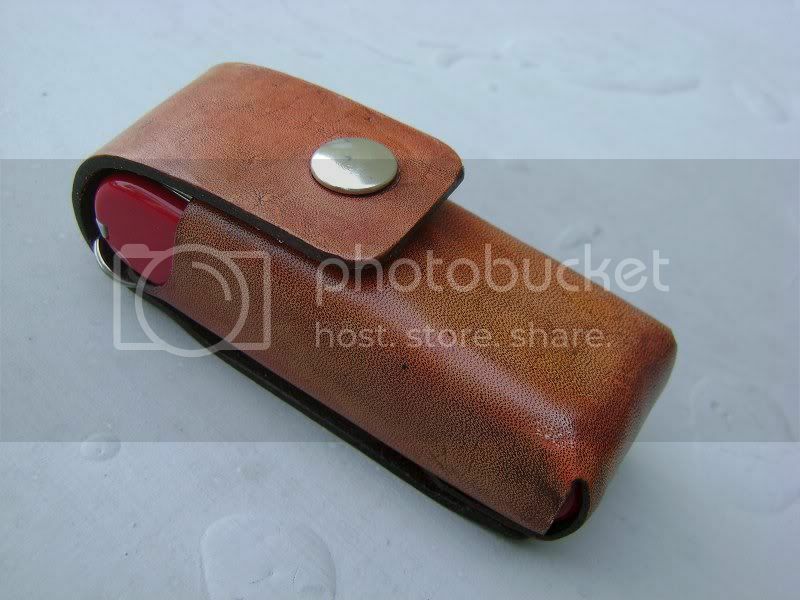 I pocket carry mine with a belt hanger in total comfort (although this can be an individual matter) or in a belt sheath. It has everything you need, or even don't need but might some day . It is very well designed so the tools work comfortably. In the "if only one" category, this would be my choice, as in fact it was for many years. The only reason I have other SAKs is neurotic compulsion. David Nowlin, jackknife and clayton c like this. I edc'd a Swisschamp for about 13 years. It is a bit heavy, but it was irrevalent after a while. The tools can be used with ease. I carried mine in pockets and carry bags for a time, then switched to a belt pouch. I currently carry a Champion Plus (just wanted to wtich things up after using the SC for so long) but still go back to the SC from time to time. the clock part can be satisfied with some of the older, more expensive version of the SC with an analog clock on the handle. Those pop up on fleabay from time to time. Is it possible to buy the swisschamp and then just buy the scales with one side being an LED and one side being the clock while still keeping the pen, pin, toothpick & tweezers? I shied away from buying a Swisschamp for awhile.I thought it would be too bulky and I would never use some of the tools.I could'nt have been more wrong! It is not too bulky to use at all.I don't carry it in my pocket though.I use the expandable pouch that clips onto belt or pocket.It's great! I even found myself using the odd tools like the hook and fish scaler.I wish I'd bought it sooner. Not sure. I've yet to see that configuration. I doubt it's around; could be wroung, though. If anything, purchase a flashlight for use with the SC. 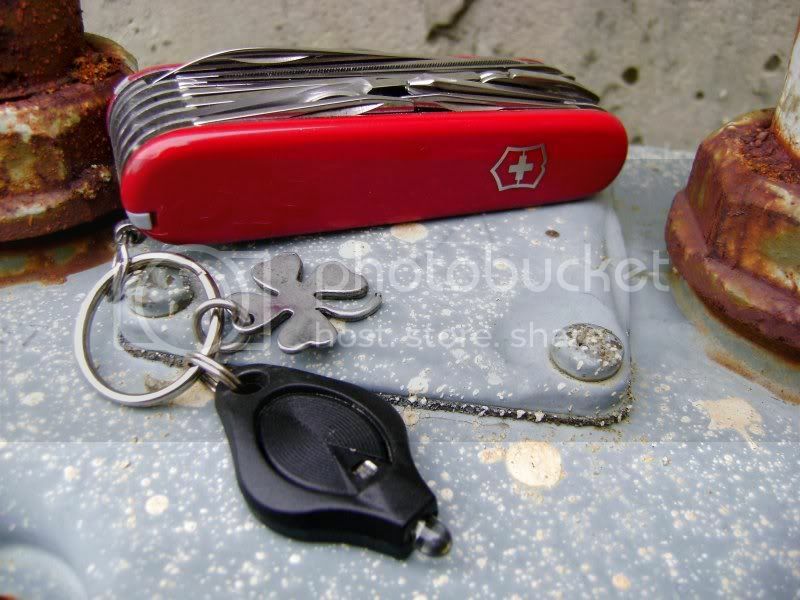 IMHO, led's on SAK's are next to nothing for use; a photon light stays on my keychain because of this. I love the Swisschamp enough to own 3 of them. It's a very interesting knife, to see it's evolution over the years. Victorinox makes these little changes to the design, here and there. The magnifier changes, the file changes, the pliers change a bit, etc. All in all, it's a pretty useful tool. The pliers won't do the work of a large multitool or anything, but they do work very well on smaller chores. The Phillips screwdriver isn't anything to brag about, but it will do the trick very often. The only real downside to me is the cleaning of the tool. Using the wood saw or the fish scaler can make a real mess, and it can take time to get the Swisschamp cleaned up afterward. I usually use a leather pouch to carry the SwissChamp. 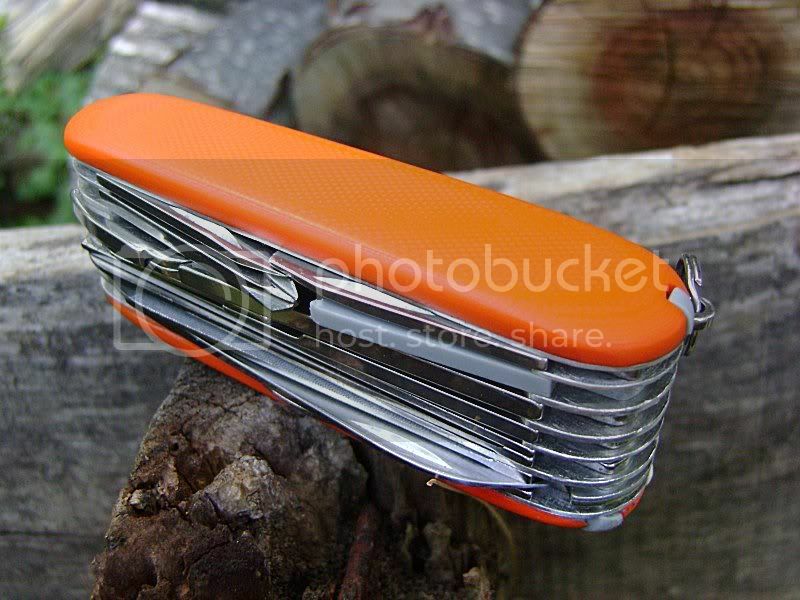 either a home made one or a Victorinox model. I do own belt hangers, but prefer a belt pouch for a tool of this size. There are other options though. For strictly outdoor use, I kind of prefer something like the Ranger or Huntsman. They are less to lug around, and only possess the tools I need for the outdoors. They work very well with a lanyard or belt hanger. For more urban settings, I totally dig some of the Cybertools. The bit driver on the Cybertool blows away the various drivers on the SwissChamp. But as an "every place and every job" kind of tool, the SwissChamp rules. Ace Rimmer and Skorzeny like this. The Swiss Champ is as big as most folks will go for EDC. I use the same Vic belt pouch as Buzz has shown above and find it a great way of carrying the thing. Adding a fob/lanyard makes it a little easier to pull it out of the pouch. For me the Champ is the one that made most folks fantasise about having a SAK as a kid. The seemingly endless tools that will be able to get you out of any scrape, the fun just playing with all those tools in a very neat package. Interestingly I probably carry my vintage Champion more but I would say the everyone should have a Swiss Champ even if its just to play with. Swiss Champ is good to go! If you are going to get a SAK, might as well get this one and be done with it. But then I am a tool freak and have several MTs and SAKs. But it has some winning qualities. The little pin that is hidden inside the scale is a stroke of genius. I have had mine a long time. It sits here on my desk as I type, waiting to be called into service. A faithful friend. The Champ is a great multi-tool. I got mine in Switzerland, and carry it in my bag every day. I have it in my "survival kit" inside my bag though, so it doesn't get as much use as it probably should. I use my Wave most of the time instead, mostly because it's easier to get at. The mini-champ is another great one. Perhaps the best keychain multi-tool ever made. I use that one constantly. I have a minichamp. But the old one without the phillips screwdriver. The Swisschamp is the best SAK IMO, and I also like it better than any other multitool for an EDC tool. I have two. One always rides in the dash next to my steering wheel. I've carried the Swiss Champ, every day, for the last 34 years! Its the best, single tool which I've ever carried. I updated to the later models when they appeared, and would give my original model to a friend whom would appreciate it, and use it. Hey Buzz, pretty sure Ive seen that brown leather pouch of yours in various swisschamp threads. can u PM me with info? The OP hasn't been on BF for about 9 1/2 years, and it's been nearly 9 years since the last post. 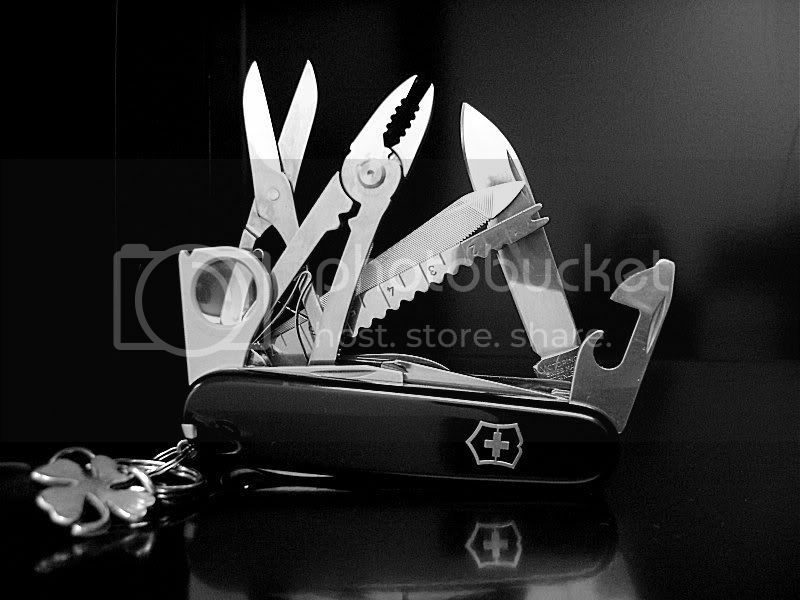 You've got my attention>> are all the Swiss Champ Victorinox models made in Switzerland? I've kind of noticed that a lot of Victorinox high end models are made there in Switzerland instead of being contracted out in some third world country? I love Swiss and German made stuff. I still have both my Victorinox Swiss Tool and Swiss Tool X that were made in Switzerland and they have served me very well over the years. You've got my attention>> are all the Swiss Champ Victorinox models made in Switzerland? All Victorinox knives are made in Switzerland. There are two factories. One in Ibach, and one in Delemont, but both in Switzerland. If a knife wasn't made in Switzerland, then it isn't a Victorinox.